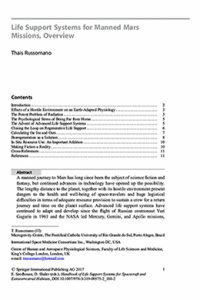 Congratulations to ISMC Board member & Chief Medical Officer Dr. Thais Russomano on the publication of her book chapter – Life Support Systems for Manned Mars Missions, Overview – a part of the Handbook of Life Support Systems for Spacecraft and Extraterrestrial Habitats, Published by Springer International Publishing. This Living Reference Work will develop and grow over the coming months to focus on all aspects of a manned trip to Mars, for example, the climate that will await space travelers, the life support systems necessary to keep them alive on the journey and on the planet, the dangers posed by space radiation, and the physical and psychological effects of living in an extreme environment 54.6 million kilometers away from friends and family on Earth. Dr. Russomano is a leading international authority in Space Life Sciences, specializing in the effects of low-gravity and microgravity environments on the human body. She is a published author of numerous scientific articles in peer-reviewed journals and Chapters in books, as well as having published 6 books in the areas of Astronomy, the Space Life Sciences, and Aerospace Biomedical Engineering. The Chapter abstract (doi: 10.1007/978-3-319-09575-2_188-2) can be accessed at the Springer Link website.